Among the Amish, rugmaking is a thriving cottage industry that goes hand-in-hand with quilting and cloth handiwork. 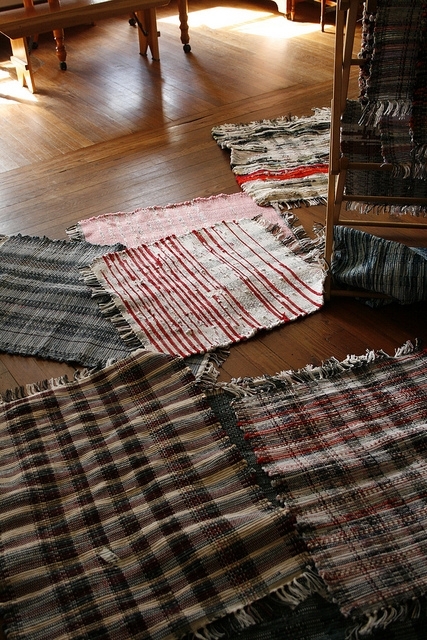 Amish craftspeople often create rugs from scraps left over from quilting or making clothes. They come in a variety of shapes, sizes and styles as you can see below. A rug is what you get when you go into an Amish shop to buy a quilt, see the prices, and think “maybe next time”. It’s the consolation prize of Amish textile shopping. Nothing wrong with that though–floors need prettying up too. 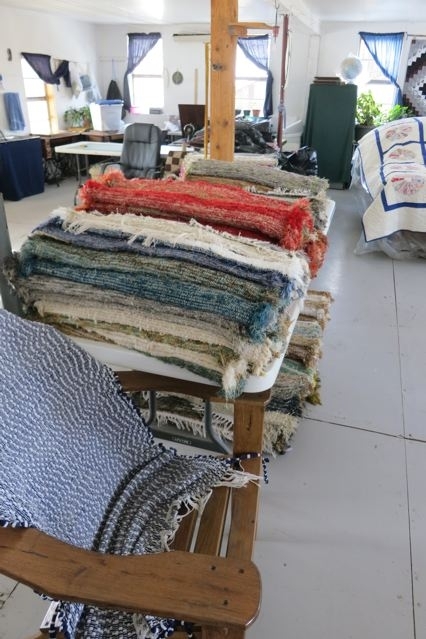 If your floor’s looking a little bare, Amish Workshops has a cool selection of affordable hand-woven Amish rugs. Anyone own an Amish rug? I got mine in Big Valley, Pennsylvania. Who knows, it may be the only Amish-made rug in Poland. Rag rugs were very popular among the Swedish immigrants of northern Maine, and a number of women in the community had had big rug looms. They used the mill end runs from the woolen mills downstate, or stripped old wool clothing. I used to give weaving demonstrations on the rug loom at the museum where I worked. A rug is fairly cheap and quick to weave compared to cutting, piecing and stitching a quilt! I prefer my floors bare, though. I found what Magdalena said very interesting. My grandmother was from Sweden, and I have several rugs she made — especially like the top one. I haven’t seen rugs for sale like these at the Amish shops I’ve been to, but I have only been to ones in KS and CO. I’m sure they can be found back east. I enjoyed looking at the sites you recommended, Erik. Thanks! Does the prep (setting up the warp, etc.) take as long or longer than the actual weaving? It seems quite labor-intensive, but as you said, simpler, I’d think, than cutting, piecing and sewing quilts! Weaving rugs is another one of those “women’s” crafts that I love and can appreciate, and what beautiful, practical results! I’ve been “window shopping” (or is it monitor shopping, done online?) for all kinds of Amish crafts, including rugs. I’ll probably have one someday, but don’t own one just yet. I use the mill ends to crochet rag rugs. Haven’t done it in a few years but still have tons of mill end fabric to work up into rugs. I have done ovals, hearts, rounds and rectangles. Love to do it when I have the time. Would love to weave but have never had the money for a good loom. Maybe someday! Also want to try braiding rugs. 🙂 I have also used the same fabric for piecing quilts. Buying mill ends by the pound is much less expensive than fabric from a store then cutting into strips. Would you consider selling your mill end strips? Charlene, sent me an email at ceramics_lady@mchsi.com I would be very willing to talk to you about the mill end strips I have. Let me know where you are located when you email please. Thanks for sharing! I also make rag rugs with left over scraps. I crochet mine. I would love to learn how to weave them though. I have a love hate relationship with carpets. On one hand carpets are soft and fun to lay on. But hardwood for example looks more eloquent. The solution is rugs. 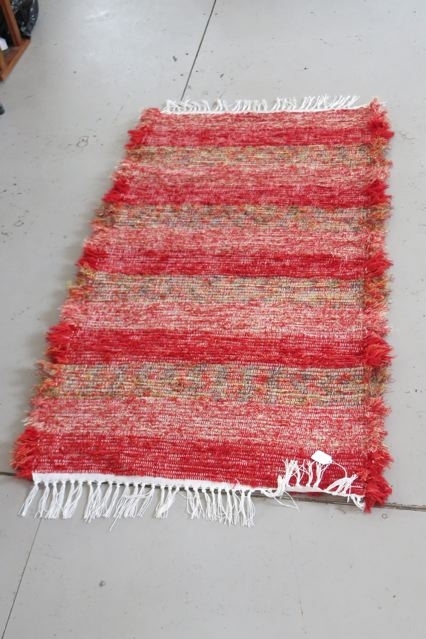 Since I do not live in Morocco and large quantities of rugs at cheap prices on every street corner, in the USA we have a choice of generic rugs from China most likely or something like an Amish rug. When I have more money the latter option is what I will consider. Love the woven rag rugs! They are colorful and can be used to warm the floor or block a draft to save energy in the winter. The best part is they use fabric that otherwise might not be used. This is what I call “creative recycling”. Yes, I have one Amish rug. I prefer to wash it in a front-loading machine. I used to know an Amish woman who made rugs out of plastic bread bags. I remember her saying not to shake the rugs too hard when you shake them off, so they last longer. (Shaking the carpets too hard makes a snapping sound.) She kept the cleanest side of the rug up for Sundays and company, and the dirtier side up for everyday. Some older people do away with throw rugs because of the danger of slipping or tripping and falling. One time I went to visit a lady who was at home recuperating from a hip surgery. All of her carpets had been gathered up and were stacked in a pile by the wall, unused, so she wouldn’t fall over any of them. Nope, don’t have Amish rugs, but many Hutterite ones. (-: You can see some on my blog on the recycling page. I have been writing a glossary on Oriental and Persian rugs for the past few years, and I hope to have a release date later this summer for the 100 page book. Being a purist I hesitated to write outside historical rug making. However, about a year ago, I began leaning towards European rug terms then Navajo, western saddle pad and American ticking rug terms. I want to include European Amish history of rug making and migration of the Amish into North America and their rug making techniques, terms, etc. Can you point me in a direction? Thanks for the nice blog. 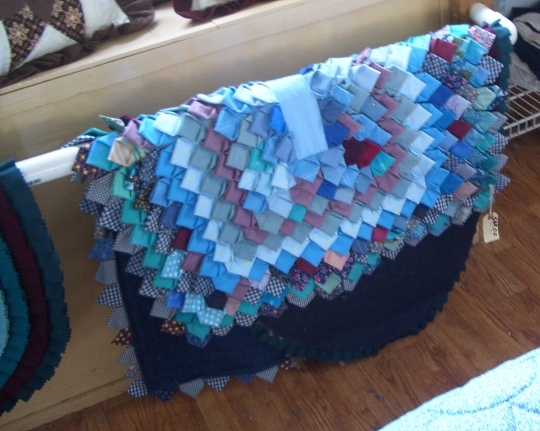 I would love to purchase the quilt on the quilt rack in the first picture or if I could get a pattern I would like to try and make one. I recently ordered another set of Amish loomed rugs and made the mistake of ordering 20ft long runner instead of 12ft runner. Can I have it cut and save the two pieces? Or can anyone recommend a place or procedure to take care of this problem.